A couple of nights ago, contrary to the amazing sunshine and warm weather we’ve been having, we had a torrential downpour accompanied by some insane winds. Granted, we didn’t get all the hail or any tornadoes like some of the surrounding cities did but it was rough there for awhile. The big, heavy BBQ pit on the back deck was blown all over the place, chairs flew off the deck into the yard, and trees were blown down on the roads leading out to our house. J and I both stared out the window, watching the sky and wondering if there was a chance a tornado was headed our way. Thankfully that was not the case, but geez-Louise…that wind was a crazy beast. You may be asking yourself what in the world the weather update has to do with these pretty little thangs right here? Well…nothing, really. Except…wait for it…they’re a whirlwind of flavor in your mouth! Wait, wait!! Don’t close the screen, rolling your eyes in disgust. It was cheesy, I know. But some days I just can’t help myself!! Forgive me? It’s no secret that I love all things tortilla. Tacos, burritos, enchiladas, and of course…taquitos!! 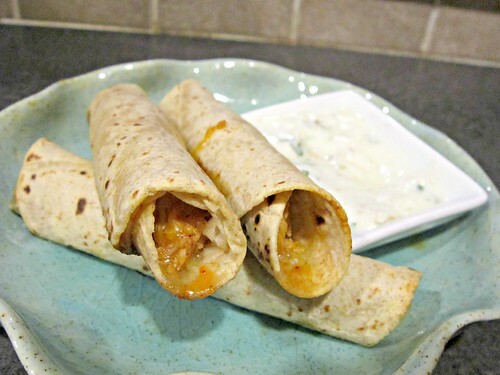 I’m not fond of the fried variety or those made with corn tortillas (by me, anyway – I never get them right) but wrap up some great ingredients in a soft wheat tortilla, throw it in the oven to crisp up a bit and I am IN! But, you can’t have taquitos without a good dipping sauce. It’s just not right y’all. It’s like peanut butter and je… no, no… I won’t do it to you again. You get the gist though, right? And these taquitos are definitely a great addition to my taquito arsenal. My arsenal of 4 recipes. How is that possible?!?! People – get me some new taquito recipes – STAT!!! In the mean time – you definitely want to try these out. The chicken is mixed with honey, lime juice and spices to give it a sweet/sour/spicy kick and the sauce – well…it’s creamy, tangy deliciousness and I wanted to lick the edges of the bowl when it was gone. I didn’t. But the thought crossed my mind. You can if you want, I won’t judge. Preheat oven to 350 degrees, line a baking sheet with foil, spray with cooking spray and set aside. In a large bowl, combine the chicken, lime juice, honey, chili powder, and garlic and mix to coat. Drop a couple of spoonfuls of the chicken mixture onto the center of each tortilla, top with a sprinkle of cheese and roll them up tight. Place them on the prepared baking sheet and bake for about 10 minutes, or until slightly browned. Meanwhile, prepare the cilantro lime cream. Combine the Greek yogurt, taco sauce, lime juice and cilantro in a food processor or blender and pulse until smooth. Serve the taquitos with a side of the cilantro lime cream!